Kampala, Uganda | AGNES NANTABA | INTERVIEW | Allan Aloysius Ssewanyana is the Member of Parliament representing Makindye West Constituency. He is among the opposition MP’s who made news headlines for brawling in the House during debate of the controversial lifting of the presidential age limit in September 2017. The legislators pulled and tagged each other after MP Ssewanyana alleged that guns had been smuggled into the chamber. But that was not the first time Ssewanyana was involved in a public protest brawl; during his tenure as Councilor LCV for Kampala Capital City Authority (KCCA) representing constituents of Makindye West, Ssewanyana leaped over desks and heads in the KCCA Council chambers to attempt to stop impeachment proceedings against Lord Mayor Erias Lukwago. 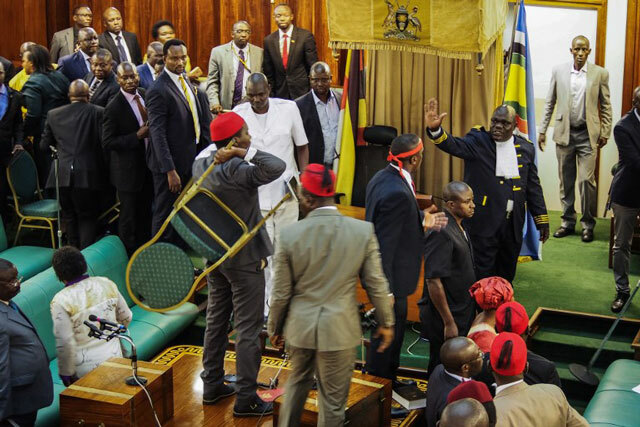 While some political analysts consider Ssewanyana’s behavior to be unbecoming of a legislator, he lists the incidents as some of the highest moments in his political career. “One of the achievements that I am so proud of is the way we dealt with the issue of Article 102 (b) of the constitution using mechanisms that to some looked bogus but made a mark,” he says. He says that a similar scenario had happened some years ago leading to the abolition of term limits but few Ugandans got to know about it. Ssewanyana maintains that the public was so detached from the happenings in the country but with the amendment of Article 102 (b), the entire country got to know how the president struggled to amend and disorganise the constitution. He says his politics is inspired by Lord Mayor Erias Lukwago whom he talks of a strong pillar in his political career. He also strives to inspire the young generation to join the struggle through elective politics and maintain the vocal voice of those who went before him. “I have maintained the strong voice in parliament for my constituency by being a star performer following in the footsteps of Hon. Ssebaana Kizito, Hon. Nsambu and Hussein Kyanjo,” he says. Ssewanyana remains critical of the way, he says, the law making house is disrespected by cabinet and President Yoweri Museveni and the high level of commercialisation of politics in the country. He says, “commercialisation of politics means going against the will of the people and using the money to manipulate them which eventually creates a generation of dictators”. Ssewanyana is also a passionate sports journalist, commonly known as ‘Omusajja Wa Bwiino’ that is loosely translated as ‘A man of facts”. He is a co-sports analyst on NBS TV for the daily lunchtime sports edition. In 2006, he joined the campaign team for former Kampala city Mayor Alhajji Nasser Sebaggala as the secretariat secretary. And when Sebaggala emerged victorious, Ssewanyana continued with his work as a sports journalist working at Top radio. It is about the same time that he got in touch with Erias Lukwago, then MP for Kampala Central who turned out to be his political mentor. During the several visits to KCC turned KCCA, Ssewanyana developed interest in becoming a councilor LCV. When opportunity arose, Ssewanyana offered to replace MP Hussein Kyanjo who had said he would not stand again. He joined parliament in 2016 on Democratic Party (DP) ticket. Born 32 years ago to Aloysius and Sarah Ssendawula in Kibuye, Ssewanyana is the fourth born in the family of ten. He started school at Biwologoma Nursery School before joining Nakivubo Blue Primary School where he sat his Primary Leaving Examinations (PLE). He proceeded to St Mathias Kalemba SS for ordinary level and Mengo Senior School. He joined Makerere University graduating with a Bachelor’s in Human Resource Management. He has two children and looks forward to getting married very soon.